Menstuff® has information on Drunk Girls. When it comes to an evening of debauchery, taking photos creates the opportunity to leave an embarrassing mark on your permanent record that isn't easily erased by public service or a cheap bribe. Posting such photos on the Internet guarantees it. We at Asylum always want you to be safe and happy, so we've turned to the lovely ladies of MySpace and Facebook for important life lessons about the repercussions of alcohol. Take heed. The Quick Clean: If there's no soap in the frat house bathroom, you can easily improvise. Smart Shopper. 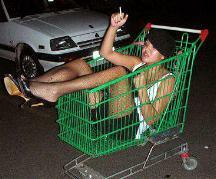 You can't buy class, even if you put it in a shopping cart. Mixed Drinks. Never throw out the leftover open drinks. There's always someone willing to take a dare. Stand Tall. Don't be afraid to do a keg stand on a mini keg. Get a couple of friends to help, and remember: United We Stand. Hurl, Interrupted. Bring a bucket if you're planning to drink heavily. There are some things you don't want to rely on friends for. Bucket Lesson #2. When bringing your own bucket, make sure to color-coordinate it with your Ugg boots. Doesn't she look happy? On The Tiles. Even drunk people can be helpful at clean-up time. Simply roll them in towels for an impromptu mop. Clean-Up Time. 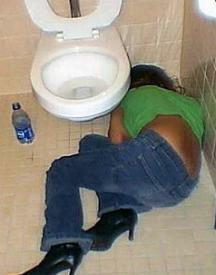 While drunk people aren't the ideal substitute for vacuum cleaners, they often come very close. A Shiny Caulk. A frat party is the perfect place to find someone to polish your caulk. The Perfect Pose. Always be aware of the camera. Posterity awaits. Let the Games Begin. Alcohol allows you to start a game of Twister anywhere, even without the mat. A Smarter Shotgun. You don't need a textbook to learn an important physics lesson. The Painted Lady. 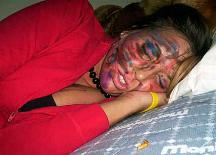 The perfect time to demonstrate Native American war-paint colors is about 4 a.m.
Hollywood High. 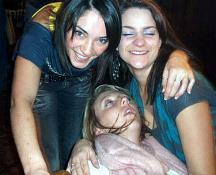 Re-enacting "Weekend at Bernie's" is always just a few Jäger shots away. The Paper Chase. 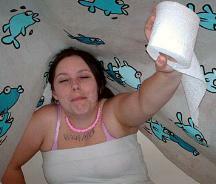 A friend with toilet paper is a good friend, indeed. Ahhhhh. When your feet are cold, sometimes you have to improvise. Devil Horns. When you're really drunk, the angel on your shoulder passes out, and the devil on your other shoulder guides you to the bathroom. Get Home Safe. Always designate someone to take you home. Even if said person doesn't own a car.